With the kick off of May, it’s officially grilling season on the prairie. Despite the crazy non-Spring like weather, we marinated, rubbed and slow cooked pork ribs on the grill yesterday. We are novice grillers compared to many die-hards. As long as the end product turns out yummy, we don’t sweat the details too much. Yesterday’s pork ribs were a hit. We marinated, rubbed and grilled. 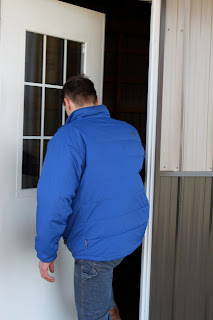 It was easy, hassle free and will be definitely become a “go to” meat to grill for us. I did a little research and found Grilling Companion which is now our resource and plethora of all things grilling for any type of seafood, fish or meat. We have a gas grill which is “looked down on” by the die-hard grillers. But it works quickly for us. I need quick meals. 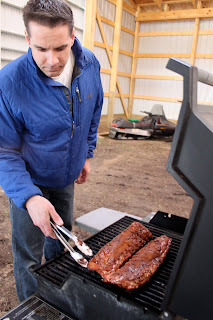 Grilling Companion has a great step by step process of how to grill ribs relatively quickly on a gas grill. We loosely followed it yesterday. If you are just getting started and consider yourself novices like we are, I highly recommend it. Before reading Grilling Companion and before church yesterday, I started with what I know. It’s what my GriggsDakota mom does with ribs. I dumped in Coca-Cola, liquid smoke, season salt, garlic powder and fresh ground black pepper. There was no measuring. It’s what the spirit calls you to do on a Sunday morning. I would hold off on too much salt because ours got a little salty after I put on the afternoon dry rub with salt in it. I covered them in foil and put them in the fridge. You could do this the night before and forget about them. Our teenager once watched a Food Network show on cooking with Coca-Cola with my mom. He insisted we do this method and was pleased to see me dumping Coca-Cola on the meat. I forgot about the ribs for about 7 hours and then made this dry rub. It was fantastic and we’ll be using it again and again. Stir all together and rub on ribs. This makes enough rub for 5 lbs. of meaty ribs. I drained off the remaining Coca-Cola and then, rubbed down on both sides of the ribs. I forgot about them again and passed the grilling baton off to the grill master of our house, my husband. The wind was howling so he hid the grill in our new building. I call it the “barn” but Nathan doesn’t like that because that indicates he agrees with me putting animals in it. Oh someday but for now it’s his building for work and storage purposes. Nathan had soaked hickory pieces in water and put them in the smoking slot of our grill. If you don’t have one of those, you can create a smoking pouch with foil for your gas grill. Hickory wood gives off a strong smoky taste. The temperature shouldn’t exceed 300-325F on the grill. Nathan admitted he cranked it up initially and won’t do it again. He promised. 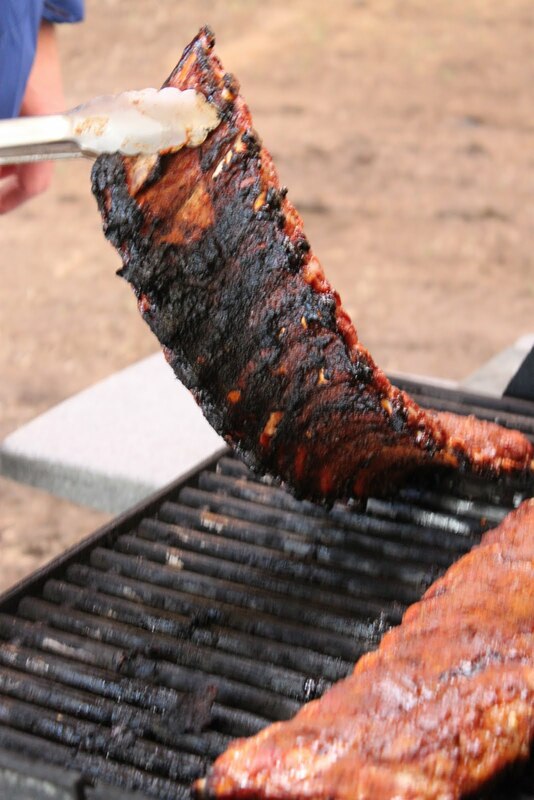 Next time we are going to use rib racks that are very inexpensive to purchase so they don’t get so dark one side. Leave covered on the gas grill for 2 hours at 300F. Watch a football game. Read the newspaper. Fold clothes. Take a snooze. Literally, these are hassle free. Once your meat thermometer reaches 160F, your ribs are ready to eat. Not every novice grill master can take a nap when he is tending to his hunks of meat. But you can if you want. We shared these fantastic ribs with friends last night and enjoyed roasted red potatoes and steamed broccoli with them. 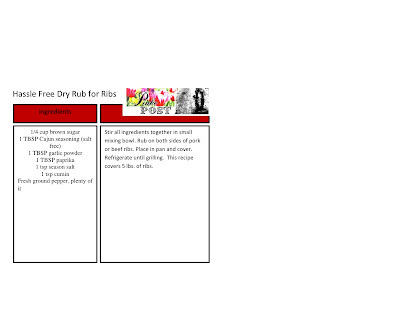 For Beyer Beware’s Hunk of Meat Monday, I created my first ever recipe card with the dry rub recipe on it. You can click on it below and print it off if you would like. It’s not perfect but it’s my best attempt in a hurry. I’m linking up for Hunk of Meat Monday. What’s your experience with grilling? Can you teach us some tricks? Okay so it wasn’t a good idea to read this post with no ribs in sight! 🙂 YUMMY! My mouth is watering and now I’m wondering what I might find to eat for lunch today 😉 I promise it won’t be ribs! Ha! Excellent tips and suggestions Ms. Katie. And don’t worry, the Cecil’s have a gas grill for quick dinners too. Who has time to wait for good oak wood to come to temp?! As for your rub, looks spectacular. And as you requested, stay tuned for some pictures later today from California in our back yard over the weekend where the garden is continuing to grow and the sun shines. 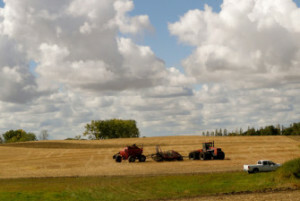 I’m keeping my fingers crossed for sun and warmth on the Prairie now! Definitely saving as a recipe to try. Looks tasty and easy! Wow. That looks amazing! Memory Lane Friday this week is 4th grade. Or Mother’s Day. maybe I’ll give people a choice. Thanks for letting me know I need to update! 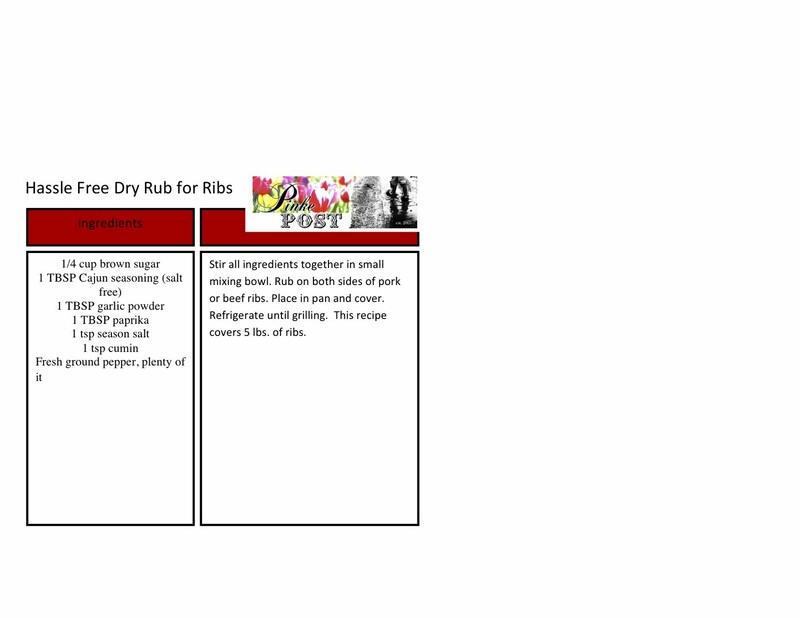 I have a great ribs marinade I should share with you…it has mogan david wine, soy, garlic, and some other stuff. You can marinade your ribs for like 5 days in that stuff, then grill – the ribs are amazing! These look awesome Katie! Love the smoker in the gas grill to make the meat have added flavor! Ok, would this work with short ribs? I have a ton of them in the freezer from all our butchering. I need to use them up, but I’m not sure what to do with them! Yours look awesome!